Sacel nestles and Rodna Mountains. The village of Vadu Izei, famous for its artisans and woodcraft, sits at the junction of two important rivers, Iza and Mara, about 7 km south of Sighetu Marmaţiei. Inhabited ever since the Bronze Age, as a treasure of bracelets and silver coins prove, the village was first mentioned in 1383, but with the name of Satul lui Lupu. Nowadays, it is not only the junction of rivers, but the junction of two major roads, the DN 18 and the DJ 186, that gives importance to the village. In Vadu Izei there are painters of icons on glass, like Ioan Borlean; weavers such as Maria Moldovan and Ileana Borlean, who make blankets and carpets with vegetable dyed wool; and basket weavers such as Mihai Petreuş, who make beautiful baskets and other objects using willow and hazelnut. There are also numerous musicians and singers, and the people of Vadu Izei are not called dobaşi (drummers) for no reason. In accordance with this, every year in July, there is a wedding festival, Festivalul Nuntilor. Groups of folk musicians and dancers come from all over Maramureş, from other parts of Romania and even from abroad, to perform songs and dances related to the traditional wedding. There is a small museum The House Museum of Vasile Kazar near the new Graeco-Catholic church. It is a household built in the 18th century, with old objects and textiles to show how the villagers lives still a short while ago. Besides well-appointed pensions, there is a tourist information office near the town hall and the post office. 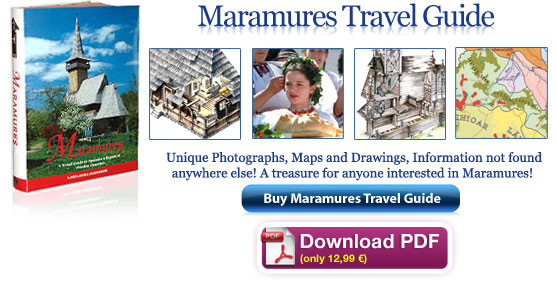 From here one can buy maps and books about the region, various handicraft objects (icons, pottery, costumes, masks, etc. 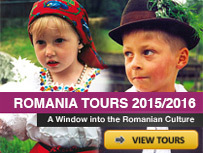 ), and hire a local guide for a tour of villages in the nearby river valleys. 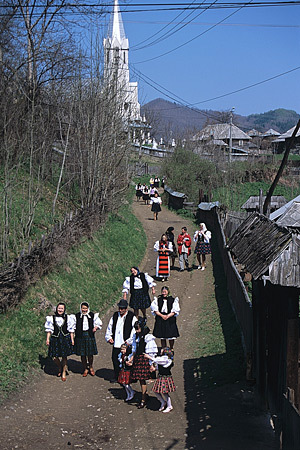 People returning from the new church of Oncesti. 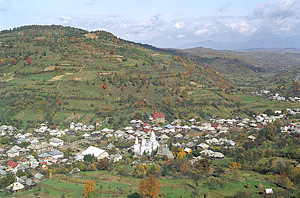 The next village from Vadu Izei, five km up the Iza River Valley, is Onceşti with its 1,500 inhabitants. Various archaeological finds prove the continuity of settlement since prehistoric times: tools, jewels, and mediaeval swords. The village used to have a beautiful wooden church, which is now at the Village Museum in Sighetu Marmaţiei. Bârsana is a large village of nearly 5,000 inhabitants on the right bank of the Iza River, about 20 km southeast of Sighetu Marmaţiei. Besides the main road DJ 186 that runs up the Iza Valley, the DJ 185 connects the village with Ocna Şugatag and the Cosău Valley. Bârsana is one of the more famous villages in Maramureş due to the monastery built quite recently, which has become a symbol of Maramureş and of the wooden architecture. Moreover, there is the old wooden village church of The Presentation of the Virgin Mary at the Temple, built in 1720 as the monastery church, that is on the UNESCO World Heritage List. Glod is a small village up in the Slătioara River valley. It is about 10 km south from the DJ 186, taking the narrow DJ 171D in rather bad condition that starts from the main road at a place called Podul Slătiorii, the Bridge of Slătioara. The people from Glod seem to have music in their blood: the Petreuş brothers are famous folk singers, and there are many other musical groups of young performers in the village. The houses of Barsana village. Poinile Izei is roughly four km from Glod towards Botiza and Şieu, surrounded by the foothills of the Lăpuş Mountains. It is a village of about 1,100 inhabitants with strong traditions. A picturesque Maramureş village, Botiza with its 3,000 inhabitants is located at the foot of the ţibleş Mountains, on one of the tributaries of Iza, the Botiza River. 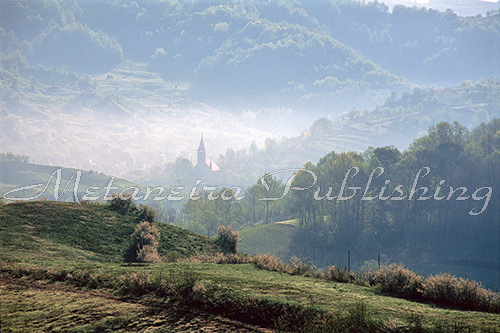 It is about five km southeast of Poienile Izei, on the county road DJ 171 A. Botiza is surrounded by high hills, covered with dense forests and orchards. There are also numerous mineral water springs, including a salt-water spring that has been used to salt meat. A market is held every Saturday. Back to the Iza River Valley, and the main county road DJ 186, Strâmtura is the next village after Bârsana, some seven km from it. Strâmtura prides itself with the last buciumaşi of Maramureş, the players of the traditional alpenhorn, a long metal horn that mountain shepherds used as a means of communication. The village is also famous for the folklore group made up of both children and adults. Botiza River has its source in Tibles Mountains. Rozavlea is a village of more than 4,000 inhabitants on the right bank of the Iza River, seven km upstream from Strâmtura, and about 37 km southwest from Sighetu Marmaţiei via DJ 186. The oldest finds are from the Stone Age, although written mentions start from 1353. Every year in late August are held the Cultural Days of Roza Rozalina where folkloric groups come from different parts of the region and the country, and the traditions of Maramureş are discussed in a symposium. 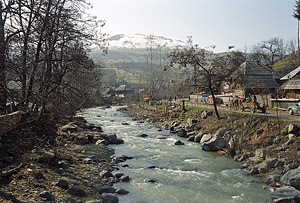 Şieu is the next village up the river from Rozavlea, only two km distant. It is at the junction of two rivers, the Iza and its tributary the Şieuţ, and of two roads, the DJ 186 that runs from Vadu Izei to Săcel and the DJ 171A that starts here and goes south to Botiza and over the mountains to Lăpuş. Each year in Şieu is organized The Meeting with the Sons of the Village, an event in which take part people who were born here and who have made a career somewhere else. Also, every summer there is a folkloric festival of song, dance and dress to which come numerous groups from Maramureş. There is also a local folkloric group that participates in various contests and festivals around the country. The town of Salistea de Sus. One of the most famous villages in Maramureş, Ieud is situated on one of the tributaries of Iza River, called Ieud. Just before the road from Şieu reaches Bogdan Vodă, a side road leads off towards south. There are nearly 5,000 inhabitants in the village that stretches for many kilometres along the river valley towards the ţibleş Mountains. The name of the village is also related to the famous Codex of Ieud, the oldest manuscript written in Romanian language, in Cyrillic characters. There is a small private ethnographic museum in the courtyard of the Pleş family. Ieud is a highly traditional village, abortion and divorce were virtually unknown here until recently, and during communist times the village was renowned for its 50 “heroine mothers” who gave birth to more than 10 children each. Bogdan Vodă was known as Cuhea ever since early mediaeval times until 1970. The village is at the junction of two roads: the main Iza Valley road DJ 186, and a smaller road DJ 188 that leads through very beautiful terraced landscapes to the village of Bocicoel, that is part of Bogdan Vodă, and then on to Vişeu de Jos and the Vişeu River Valley. It was the seat of Voivode Bogdan, the centre of his kneazate until he crossed the Carpathian Mountains and founded the state of Moldavia in 1359. In 1970 it was decided to honour the most famous inhabitant of the village by changing the name to “Lord Bogdan”. Botiza with the church in the center. Dragomireşti is 3 km upriver from Bogdan Vodă by the DJ 186. It is a town about 3,100 inhabitants with its own small hospital, an office of the Forest District that administrates all the forests in the upper Iza Valley. There used to be a beautiful old wooden church in Dragomireşti, built in 1722, but it was transferred to the Village Museum of Bucharest already in 1936 together with other buildings and appliances. There is a new Graeco-Catholic wooden church, built in the traditional Maramureşean style. 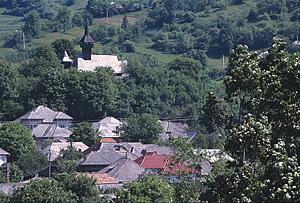 Just as Dragomireşti, Săliştea de Sus became a town in 2004. It is located on the DJ 186 4 km from Dragomireşti, and spreads on both banks of the Iza River. the town has two wooden churches, both dedicated to St. Nicholas: The Church of the Buleni Family and The Church of Nistorescu Family. 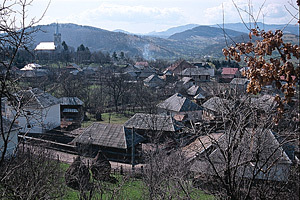 The last village in the Iza Valley is Săcel. It is 8 km from Săliştea de Sus via the DJ 186, and about 20 km from the towns of Vişeu de Sus and Borşa in the Vişeu Valley by the DN 18 and DN 17C. 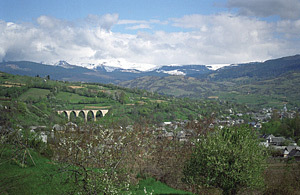 The train passes from here, coming from the Vişeu Valley and continuing south across the mountains to the county of Bistriţa-Năsăud in the south. Săcel has been an important centre of pottery for many centuries, and even today the most traditional type of unglazed pottery is made here. I was thinking of spending a few days walking through the Iza Valley along the DJ186 – it it a the sort of road you can walk along, or is it very busy with traffic? This area is incomparable. All is charming and the hillsides are wonderfully rich. But: we walked from Botiza to Ieud: 2 hours there and 8 hours back (we got lost). No houses, no tracks, no people! So take a compass . . .